The High Atlas Mountains are a superb location for mountaineering, trail running, and altitude training. 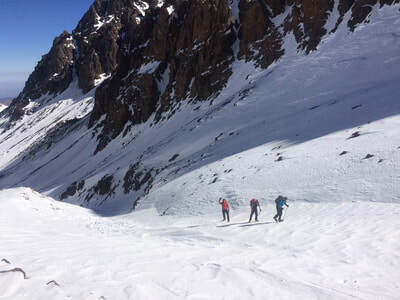 They provide an accessible option to summit some stunning 4000m peaks, experience the ancient Berber culture, and explore a relatively quiet mountain range in Alpine-esque conditions We only run these trips when the High Atlas are at their finest, avoiding the heat and dryness of summer. 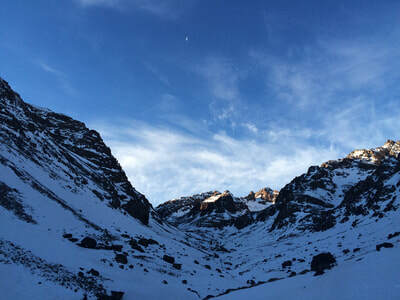 Our three 4000m peaks are Mt Toubkal 4167m, Ras 4080m & Timesguida 4000m. 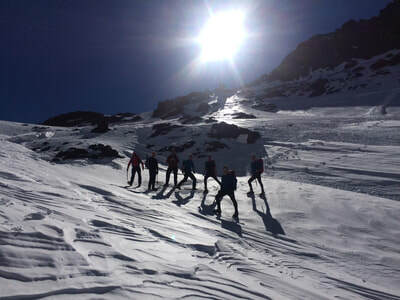 Friday: Meet at Marrakech Airport, taxi to the mountain village of Aroumd for evening meal, kit check and accommodation. Saturday: Early start, quick breakfast followed by 4 hour fast-trek to Mountain Refuge at 3200m. Trek: 10km; ascent: 1200m. Refreshments in the Refuge then climb Mount Toubkal (4167m) the highest mountain in North Africa. Dinner and relax in the Refuge. Trek 7km; 1000m ascent. Totals for the day 17km, 2200m ascent. 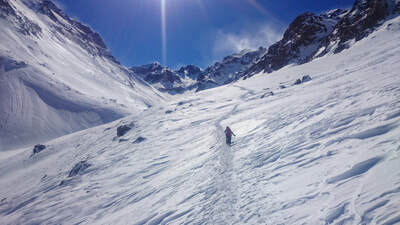 Sunday: Early breakfast, summit Ras (4082m) and Timesguida (4061m) descend back to refuge for lunch, then descend back to Aroumd for relaxation. Totals for the day 18km, 1000m ascent. Alternative dates are available for groups of 5 or more. Mike, founder of WESWIMRUN, will be guiding you. 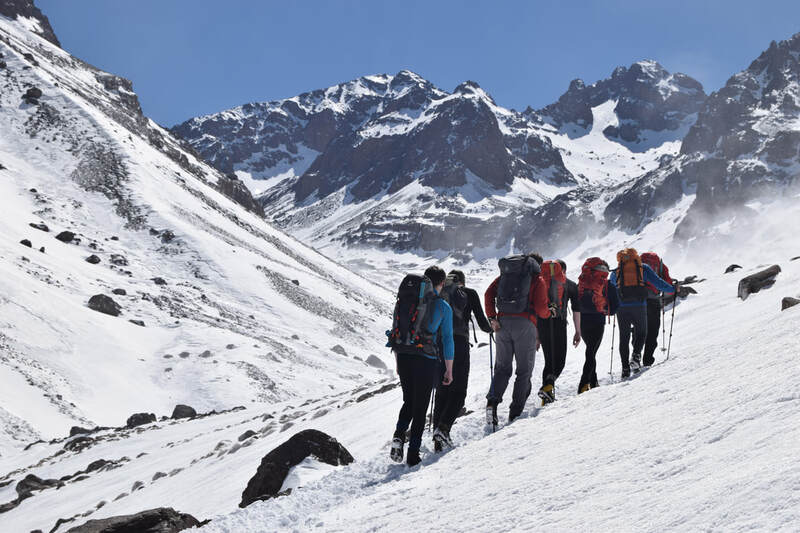 He's led groups in the Atlas mountains since 2011 and has climbed lots of big mountains all over the world including significant peaks in Alaska, Russia, Bolivia and the Alps. 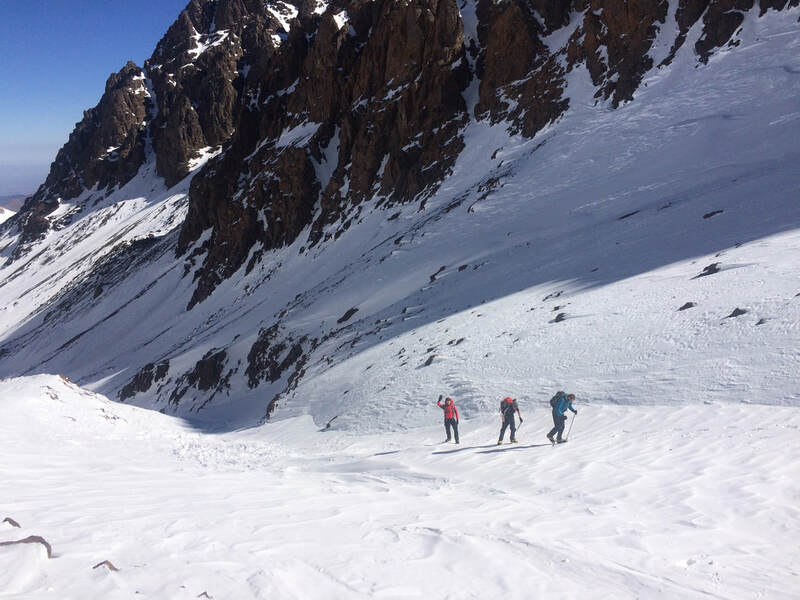 Mike has built up a great relationship with the local Berbers of the High Atlas Mountains and he loves returning every winter. His favourite memory of the area was skiing off the top of Mt. Toubkal in fantastic conditions, January 2015. To date his groups have a 100% summit success rate. 2. How old do I need to be? 3. Do I need to arrange my own flights? Yes, everything is included except international flights. Mike will meet you at Marrakech airport and drop you back at the end. All in-country travel, food, accommodation and instruction is included. 4. Where can I fly from? You can fly to Marrakech from lots of places! Some of the UK options are: Liverpool; London Stansted; London Heathrow; Manchester. You need to be in Marrakech airport for around 13:00 on the Friday. 5. Do I need specialist kit? You will need similar kit to what you would take when climbing British mountains in winter conditions. Fortunately the High Atlas Mountains have a dryer atmosphere so it is unlikely we will experience rain. You will be sent a full kit list once you have secured your place. Walking axes and/or crampons may be required which can be hired locally for £10. Training will be given. 6. What's the accommodation like? Where we stay in Aroumd is a delightful guest house with fantastic views up the valley form the terrace. There are a range of hostel style beds and some double en-suites. The standard is similar to the modern YHA hostels which most people find very comfortable. The mountain refuge (at 3200m) is more like an old-style hostel. It is always warm and the food is plentiful and delicious!